Princeton Online provides our clients with four services: Hosting, Design and Maintenance, Mobile Apps, and Advertising opportunities on our hyper local community websites: Princeton Online and Newtown Yardley Online. Advertising with us provides three direct benefits: Significant traffic to your website from over 3 million annual visitors, exposure on our robust social media platforms which have over 20,000 followers, and substantial Search Engine Optimization (SEO) due to the links from POL’s and NYOL’s highly regarded content. Clients are listed in as many categories as makes sense for their organization. We post all announcements, events, news and press releases for free for clients. Advertising descriptions are displayed based on the total amount the client spends. We provide direct links to our clients’ websites, as well as their Facebook, Twitter, Instagram and Pinterest accounts. All events and announcements are linked directly from our clients’ listings. 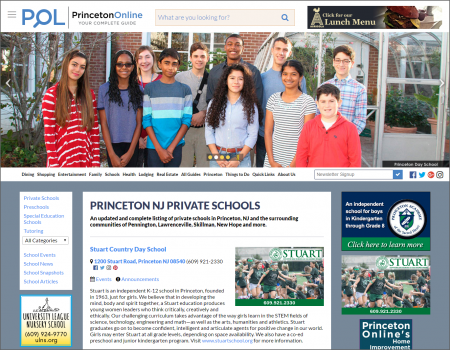 We use our own social media to boost Princeton Online’s content as well as that of our clients. We update sponsor images and descriptions at no charge. Princeton Online has recently unveiled a brand new website which is visually appealing, easy to navigate and better able to promote our advertising clients. It is one way that we are striving to do everything we can to improve the effectiveness of our clients’ advertising campaigns. We also continue to expand our presence on Facebook, Twitter and Instagram by posting daily, committing our own advertising dollars to the campaigns, and driving traffic to our websites and therefore to our clients. We give preferential coverage to clients both on our social media platforms as well as in our e-mail newsletters. While we cannot guarantee that all client content will be shared, we select from clients first before promoting events and announcements.